The sealed door to the Cairo office of El Nadeem Center for Rehabilitation of Victims of Violence and Torture after the office was closed in February 2017 (photo via El Nadeem Facebook page). Background: The Law Governing the Work of Associations and Other Foundations Working in the Field of Civil Work (commonly known as the NGO Law), Law No. 70 of 2017, went into effect after President Abdel-Fattah El Sisi ratified the law and it was published in the edition of the Official Gazette dated May 24, 2017. The draft law had first been submitted to the House of Representatives by Representative Abdel Hadi al-Qasbi in September 2016. After reviewing the draft law, the State Council returned it to the House on November 28, 2016, and the legislature approved the draft law the following day. It remained in limbo between parliamentary approval and presidential signature for a period of almost six months. The NGO Law authorizes significant government supervision over NGOs, including the right of the Ministry of Social Solidarity to dismiss an NGO’s board of directors if it fails to inform the ministry of its move to new premises, as well as a prohibition on NGOs seeking the help of foreign experts without prior government approval. The NGO Law sets forth a number of penalties for violations of the law, including prison terms lasting between one and five years and a fine for individuals found guilty of working with or helping foreign NGOs that are not authorized to work in Egypt. Significance: The NGO Law severely restricts the ability of civil society to exist, let alone operate, in Egypt. The law creates numerous hurdles for NGOs seeking to properly register and receive funding, entrenches a system of government supervision and surveillance over activities, and establishes punishments that may promise prohibitive for many NGOs to continue doing their work without fear of retribution or retaliation. 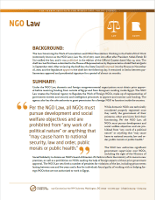 Legal Context: The NGO Law replaces the previous law governing NGOs: Law No. 84 of 2002. Because new implementing regulations for the NGO Law have not yet been passed, however, many are left unsure as to whether the NGO Law is in effect alongside the implementing regulations for Law No. 84 of 2002, or whether a slightly different combination of legal schemes currently governs the space, leaving most NGOs and civil society workers entirely unaware of their legal obligations and the procedures to which they must adhere in order to remain in accordance with the law. In 2011, security personnel raided the headquarters of multiple foreign NGOs and shuttered their respective organizations. Investigations, arrests, and prosecution proceeded, and in June 2013, a Cairo Criminal Court sentenced 43 Egyptian and foreign NGO workers, including 16 Americans, for allegedly receiving foreign funds, operating illegally without a permit, and encouraging social unrest per Law No. 84 of 2002. In April 2018, Egypt’s Court of Cassation ordered a retrial for 16 of the original defendants in the case. The retrial is ongoing. Political Context: Individuals from civil society organizations faced arrests, travel bans, and asset freezes both before and following the NGO Law’s ratification. In February 2016, the Ministry of Health ordered the closure of El Nadeem Center for Rehabilitation of Victims of Violence and Torture, claiming that the NGO was illegally operating as a human rights institution in addition to being a medical facility. Authorities later forcibly closed the organization in February 2017 by barricading its entrance. Numerous countries and foreign organizations including Human Rights Watch have condemned the NGO Law and labeled it as “draconian.” In August 2017, the United States government withheld $195 million in military aid to Egypt in part because of a number of human rights conditions, including the passage of the NGO Law; although the NGO Law was not amended or repealed, the funds were ultimately released in July 2018. Implementation: Although there has been little public reporting on the implementation of the NGO Law to date, particularly in light of the lack of clarity enabled by the government with its confusing legal scheme and lack of transparency, NGOs report a climate of fear and self-censorship in the wake of the NGO Law’s passing. Since the passage of the law, the crackdown on civil society activity has continued to escalate, with interrogations, arrests, and harassment continuing at an all-time high. Adherence to Legal Norms: The provisions and likely implementation of the NGO Law threaten to severely constrain the constitutionally, regionally, and internationally recognized rights to freedom of association and expression that Egypt is obligated to respect under domestic, regional, and international law. Egypt’s constitution specifically notes in Article 75: “Citizens have the right to form [NGOs] and institutions on a democratic basis … They shall be allowed to engage in activities freely. Administrative agencies shall not interfere in the affairs of such organizations [or] dissolve them, their board of directors, or their board of trustees except by a judicial ruling.” A law that significantly limits the type of work in which NGOs can partake, impedes the ability of certain NGOs to pursue and enjoy legal status, creates an expansive government oversight culture, and sets forth jail time for exercises of the right to freedom of association occurs in clear violation of the aforementioned obligations. Text of the Law: The official text of the law is available in Arabic here.